Making custom die-cuts with stamping imagery is easy and efficient with this set! Simply stamp your image and then cut what you see! Designed to cut a single sheet of cardstock, paper, metallic foil or vellum, the dies also make great stencils and the stamps look great all on their own! Compatible with most die-cutting machines (not included). 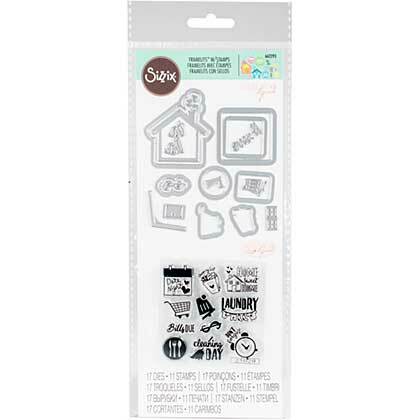 This package contains Household Planner: a set of 17 dies measuring approximately 0.25x0.5 to 1.75x2 inches and 11 coordinating stamps on a 2.75x2.75 inch backing sheet.